The Gamate is a rare handheld console which tried to compete with the Game Boy, but ultimately failed, selling even less units than the Watara Supervision. A graphic reading © BIT is present after the rest of the boot ROM's graphics. 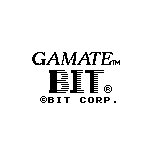 Although never displayed, an identical graphic does appear in many of Bit's Gamate games. The strings BIT CORPORATION and COPYRIGHT BIT CORPORATION are present at 0xDB5 and 0xE11 respectively in the boot ROM and are never displayed by the console. This page was last modified on 6 May 2016, at 20:21.